They can be provided as full set as well as separate part. 1) DSP is short for digital signal processing. 2) 0501 is old model, A11 is the updated version of model.0501. 3) It is widely used with cnc wood router machines. 4) With the function of data backup, it is easy to do maintenances in case if parameter changed by mistake. 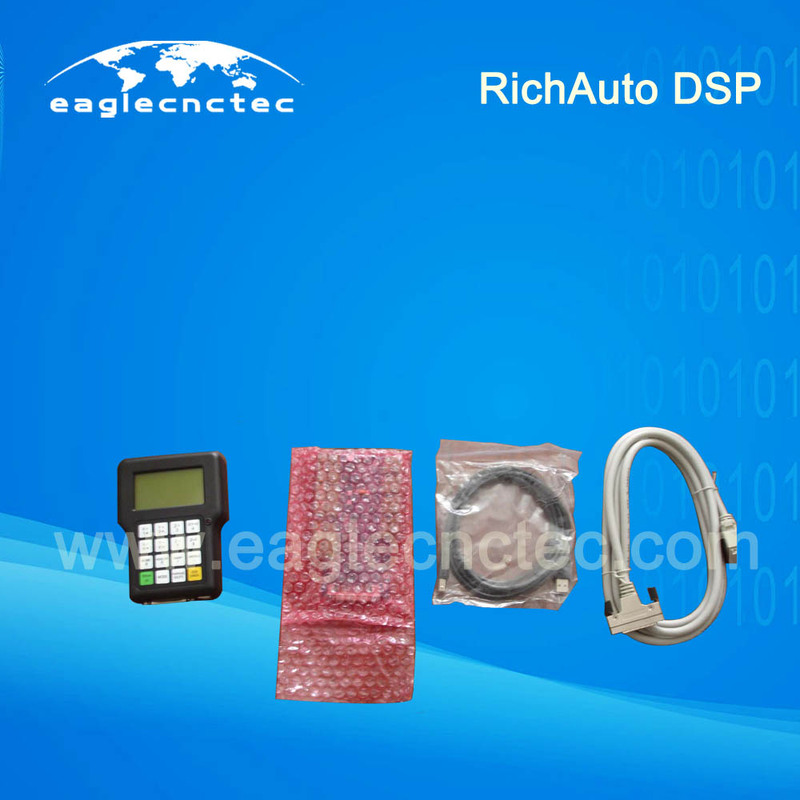 5) RichAuto DSP support the standard G code, PLT format instructions; support domestic and international mainstream CAM software, such as: Type3, Art cam, UG, Pro / E, Master CAM, Cimatron, Wentai etc. 6) Provide with power-down protection. Instantaneous power processing system to automatically save the current processing of information (file name, current line number processing, processing speed, spindle threshold), when power again machine moves back, the system automatically prompts the user to restore the processing before power down, the processing operations become more humanity. 7) Support breakpoint memory, file selection, processing. Save 8 different breakpoint processing information. 8) Multi-coordinate memory function. Provide nine working coordinate system, the user can switch among the 9 coordinate, each coordinate system can save a process origin information. 10) Support online adjust spindle operating frequency. The spindle frequency from 0 to maximum frequency is divided into 8 thresholds; 1 - 8 threshold can be processed directly adjust up and down without suspend processing. 11) Support adjust speed ratio online. Users can adjust the speed ratio, to adjust the processing speed and empty running speed, speed ratio values from 0.1-1, Ascending or descending per 0.1 numerical. 12) Simply manual operate mode. In manual mode, the system provides three kinds of sports concluding continuous, step (crawl), distance, manual operation became more simple and convenient. 13) Built-in 512 M memory. 15) Comes with USB communications port, file transfer efficiency can be directly read U disk, card reader file, Plug and Play. 16) Self-test function, the system comes with I / O port signal detection capabilities, ease of remote maintenance. 17) Processing with high-speed and smooth, support high subdivide, make sure processing with high accuracy and high speed. 18) Unique in Chinese-English to show double-interface, can be realized in switching Chinese and English show online. 19) This CNC router system can support automatic dynamic upgrades, convenient to remote operation, remote maintenance. Technical assist of CNC router dsp can be provided to you if you need. Welcome to contact. Buy all cnc spare at one stop here, our team is ready to serve for you now. Payment can be made via Western Union, Paypal, and Bank Transfer. Please inquire now. Please watch below video to learn more this Richauto dsp controller.